I was struggling to put together this post because for the first time I didn’t feel like looking back on my 2017 and classifying as a good or bad year. I think most people achieve and learn something each year, whether willingly or not. So did I in both personal and professional life. Here’s a look at the highlights from 2017 and the excitement to come in the new year. At the beginning of this year, Matt and I decided to leave Mexico. We got tired of living in a vacation town, flying back and forth to New Hampshire to pick up any electronics we ordered and products we needed for our business (it’s a mission impossible to ship things to Mexico without paying a giant tax and having it stuck in customs for weeks) and most importantly living in a place where we weren’t officially residents. If anyone thinks that getting married to a foreigner gives you an easy way to live in both countries, you’re wrong. Getting married was just the beginning of an endless process, full of paperwork and issues, basically taking the magic away from the whole event. I’ll be posting a separate post about our immigration experience and my green card once the process is done (it’s been half a year and we’re not even close to being done). In the meantime, let me tell you that we couldn’t have a normal wedding abroad like we wanted to. 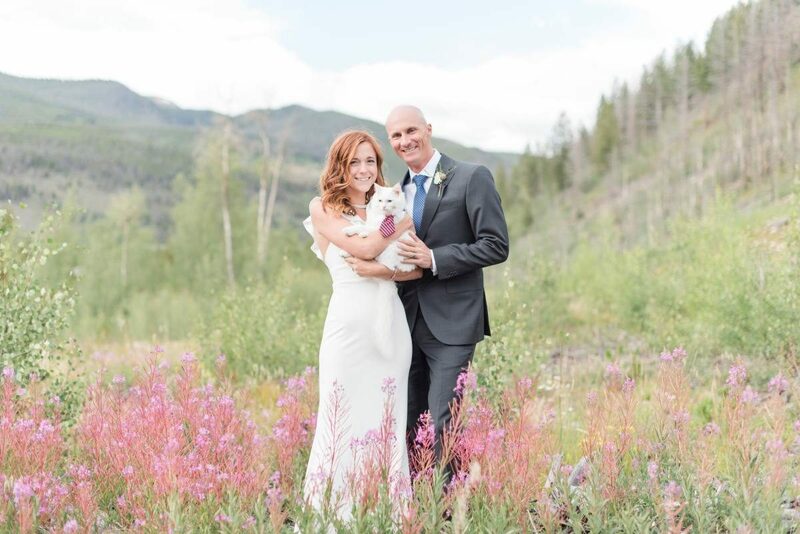 We eloped in Las Vegas in June and then couldn’t go for a honeymoon until December since I wasn’t able to leave the US. I also couldn’t work, own a car, own any documents with my new name on it leaving me nameless, have health insurance and more importantly for my job, leave the US at all. Not even for a day. Not for an important work project or family reunion. In the end, things went wrong and I actually didn’t receive my travel permit within a given timeline which forced us to reshape our honeymoon and make it a working project. Then apply for a ton of new permits. But hey, at least we made it to Africa after all! 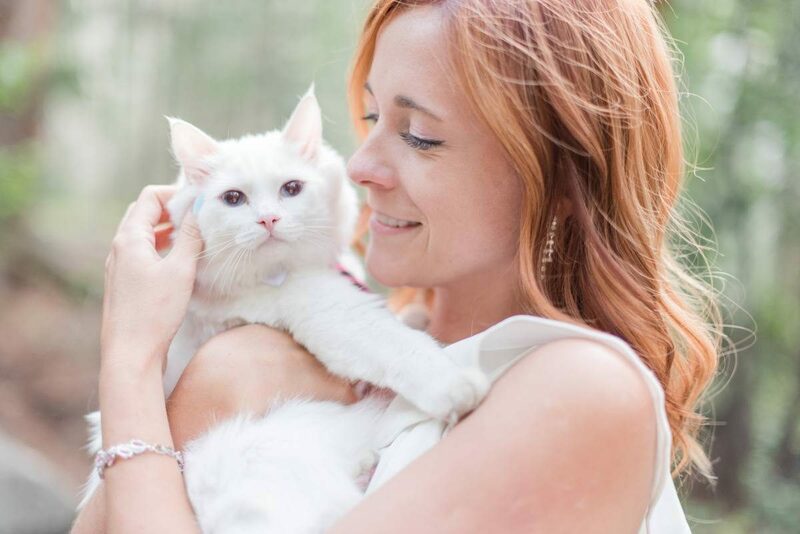 In a process, we adopted a white fluffball that, as you can see above, made an appearance in our wedding photoshoot. Poofy is the best travel cat we could have found and doesn’t mind wearing pajamas and ties. He’s not even a year old and already visited a few US states, went on a road trip and flew on a plane. We had no clue where in the US we wanted to live. We first based ourselves in Boulder, Colorado for a few months. Neither of us has ever been to Colorado, but we gave it a try and it wasn’t working for me. It was definitely not my crowd, the weather was terrible most of the time, leave alone the costs of living. Since I’ve lived in California before, we moved to Los Angeles and so far, we’re pretty content. The place is diverse, food is great, I’m able to continue my aerial and dance, and there are plenty of awesome spots to visit within a few hours drive. I doubt we’ll be in LA forever, but for now, it’s going well. I was fortunate enough to make new friends with other LA-based girls, shoutouts to Layla and Sebrin (fellow proud cat mom). People often complain that it’s hard to make friends in LA, and while I can see why big city friendships can be tough, I guess I got lucky. Here I should put a photo of 3 of us together, but I guess we’re not very good bloggers since we don’t have even one photo together. 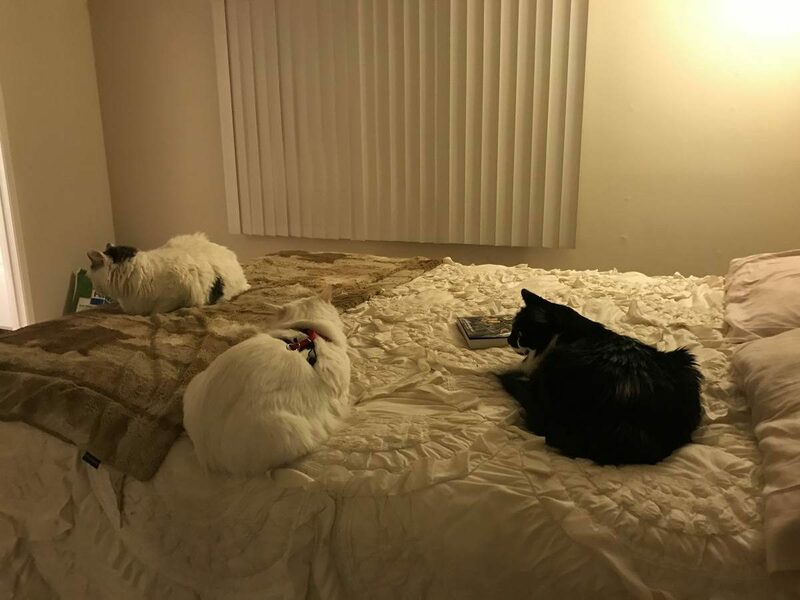 The only photo we have is a photo of our cats hanging out together. Or at least trying to have an awkward party. Unfortunately, in terms of my travel career, 2017 wasn’t the best year. For the second part of the year I barely traveled and if I did, it was around the US. I was forced to pass on some fantastic opportunities and my income surely suffered on it. However, I did a few exciting projects like modeling for a big campaign in Italy (below), taking part in the last flight of United’s Boeing 747, promoting Asheville, collaborating with Marriott in Aruba and many others. My little blog has become a reputable brand, which I’m grateful for. A very long time ago I set a mission to visit 100 countries before I’m 30. Since I’m already 29 and a half (sigh!) I know that this mission won’t be completed, partially because I don’t have time for it as I’m spending my time staying in some places for longer periods of time and revisiting certain places. Popping into a country for 5 minutes isn’t an issue, some people do it by visiting just airports and somehow it still counts. I could surely visit my ‘missing’ 23 countries over the next two months spending a few days in each, but instead, I keep coming back to some countries because I don’t feel like I explored them properly. I guess I’m not very focused on this mission anymore. Last year I promised myself to do more videos and post more vlogs. Well, compared to a year before I did post a decent amount of video. Yet, I still haven’t been recording on a regular basis, and I’m not entirely sure if I want to. Quite often when I visit some places I want to turn off my camera and focus my attention on interactions with people. Not everyone is comfortable with having a camera stick to their face when they’re talking to me and I get to have deeper conversations when the camera isn’t rolling. Next year I’m planning on focusing more on travel niches that actually fit my background, human rights and development, I’m pretty sure I won’t be comfortable shooting a video all the time. I’ll do my best though! I’ve never paid much attention to some actual fashion trends (outside of my fashion marketing diploma), but I managed to pick clothes that people liked and usually asked me where did I get it from on the street. I wanted to continue curating my wardrobe that fits my style. But in the fashion blogging world, things work slightly different. This is why I wanted to combine my style with travel and expand my niche to fashion/style blogging as well. However, most of the time companies send you a surprise package of clothes or let you pick something from a limited number of choices. Which results in the same dress or shoes in every blogger’s feed which I’m trying to avoid. Since I’m also not fully comfortable with promoting dresses for over $500 and I don’t always find the super mini dresses very classy, my options were limited. I decided to stick to my handpicked choices and buy it myself, without having to rely on any brands. I currently accept a very limited number of items, only something that I’d actually buy myself without hesitation. On the bright side, I’ve learned how to say no to things that I really don’t want to do. The best travel experience was definitely a trip to Iran. I reminded myself how much I enjoy an independent travel into the unknown. The best hotel I’ve stayed in was probably the Giraffe Manor, followed by FS Serengeti. You can’t beat giraffes eating breakfast with you. The craziest experience was flying an aerobatic plane in Las Vegas. I never thought I’d perform some tricks and fly upside down, under supervision of course. The worst travel fail was surely our lost luggage in Africa (a topic for a whole blog post) and a trip to Socotra that never happened. The best animal experience this year is a very tough to choose, since I managed to eat breakfast with giraffes, swim with elephants in Tanzania, tame camels in Oman, walk with llamas in Colorado, and play with flamingos in Aruba. I’ve never been much of a planner, but somehow a huge part of my 2018 is already planned. I’ll kick this year with a trip to Asia, followed by some time in Europe to arrange necessary visas and other boring paperwork. In March Matt and I are going to lead our first tour to remote locations in Russia (we still have some spots left if you want to join!). I’m pretty sure I’m going to turn into an ice cube, so cross your fingers for me! April and May will be filled with some travel projects that I’m yet to announce, but trust me – it’ll be very interesting. Finally, I’d just like to say THANK YOU to all of you reading my blog this past year and following me on Instagram and other channels. Don’t ever be afraid to ask any questions, comment on my photos and posts if you like them or not. It means a lot to me! I know what you mean about vlogging haha. I wanted so badly to record more videos this year but whenever we traveled I found myself not recording that much. I didn’t want to make people feel uncomfortable by filming them and I really just wanted to focus on having an authentic experience and not worrying about capturing it on video. nice post, Anna! I love your honesty and opinions. I’ve been following your blog for quite some time and I am always happy to see you are doing well. Enjoy 2018! Sounds like an interesting year! I hope 2018 is easier for you – can’t believe how difficult it is to marry and that you’re not allowed to leave! Great post, Anna!! The photo of you with the globe is simply stunning!! Praying that your visa/green card issues are worry-free in 2018! Immigration is the worst. Glad you are able to continue traveling though and have some exciting plans for this year! There was a six month period when May and I didn’t even see each other when we were going through the green card process. When you’re done with it all though it’ll seem like a distant memory. Your Russia tour sounds awesome but cold! Hope you and Matt have a fantastic 2018! Cheers! Hi Anna, I stumbled upon your site while researching Rainbow Mountain. I too am an avid world traveler but this year I’m doing something different than the traditional two weeker. I’m going to live in Cusco for 30 days because I just want to experience the culture of a place more than dipping in. Thank you for the information, I really enjoyed your blog. Love your outlook! classifying 2017 as a good or bad year detracts from the experiences, everything is a learning curve! Surprising to see Iran as your favourite destination, never really saw it as much of a holiday location, may have to look into it and book a trip! Love your honesty. Stay true to yourself. 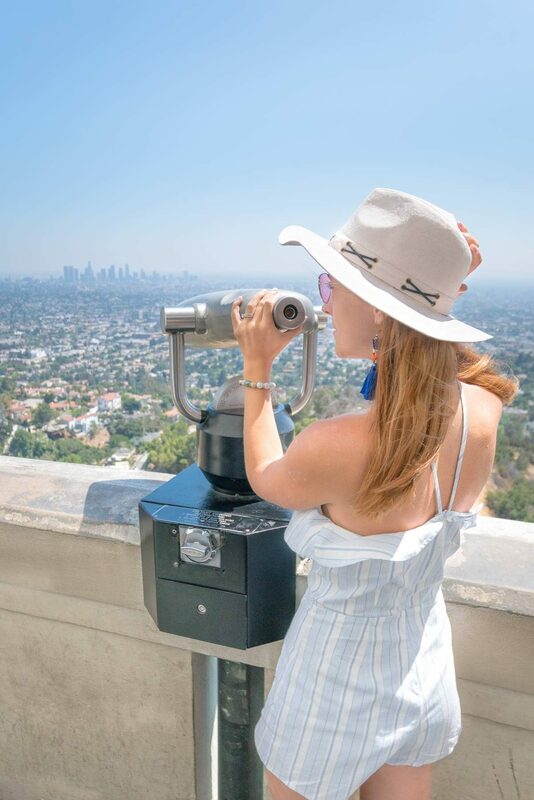 If you’d ever like to have lunch together I know some fabulous spots and live just north of LA:) It can be a friendly place! Nice Post, Opinions of your life are inspirational for me. Thank you so much for sharing your life experience!